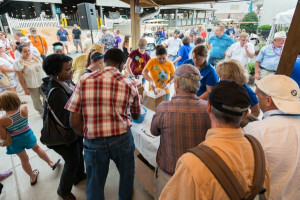 Visitors enjoy Cooperative Extension Centennial ice cream. A lot can change in 100 years. That is especially true when it comes to Cooperative Extension. 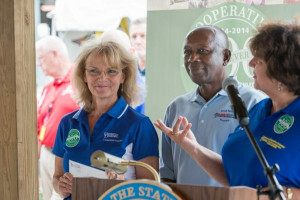 It was with that in mind, and with an eye toward the future, that members of the Delaware community gathered on Thursday, July 24, at the Grove Picnic Area at the Delaware State Fair in Harrington to celebrate the 100th anniversary of Cooperative Extension. Mark Rieger, dean of UD’s College of Agriculture and Natural Resources, says that through 100 years the mission to Cooperative Extension has remained the same, to extend knowledge from campus to field. Mark Rieger, dean of UD’s College of Agriculture and Natural Resources (CANR), spoke next and reflected on how much Extension has changed over 100 years. “I was driving down here today and I was reflecting on if I were a county agent coming from the University of Delaware in Newark 100 years ago, I wouldn’t be in a Nissan Altima, I’d probably be in a horse and buggy or coming on horseback. It would probably take me the better part of a week to come from that University to this area to see farmers and to make my way around and make my way back home — and that’s what those people did 100 years ago. They got out, they extended that knowledge from the University to the people that could use it under some really difficult conditions,” said Rieger. Rieger talked about how farmers now use smartphone apps and are able to diagnose problems in the field in real time and how, in the future, there may be flying drones used over fields and farmers may be equipped with the ability to get a snapshot of photosynthesis as it’s happening. “The means have changed but the mission has stayed the same over those 100 years. So I’m really excited about the future of Extension and all the new things that we’re going to get to do,” said Rieger, who also touched on how the people of the world are going to need to use that technology in order to find ways to feed the estimated nine billion people who will be on the planet in the next 30 years or so. “We cannot continue to cut down more forests to open up land for agriculture, we’ve got to increase the yields on the land that we have and the way we’re going to do that is with good science, good technology and extending that science through Extension out to the growers. So I’m confident that UD and Delaware State University Extension will rise to the occasion and deliver on that grand challenge of feeding the world and protecting the planet,” said Rieger. Michelle Rodgers, associate dean for Cooperative Extension in CANR, spoke next, joined on the podium by Albert Essel, associate dean for Cooperative Extension at Delaware State University. Rodgers spoke about how in Delaware, there are two universities — UD and DSU — that form Cooperative Extension and “it’s our pleasure to work together to bring Cooperative Extension to you for 100 years worth of Cooperative Extension.” Rodgers, who has familial Cooperative Extension roots dating back 100 years and whose parents met through 4-H, thanked all the legislators in attendance and explained how their support is critical to the continuation of Cooperative Extension services. “We’re very much like a family in Cooperative Extension — our retirees, those who we partner with, it is a cooperative and it’s in the name for a purpose and it’s because we do cooperate so well with each other. It’s a very meaningful part,” said Rodgers. Joyce Witte (left) is honored for her winning Cooperative Extension Centennial ice cream flavor. Rodgers then recognized all the staff members, both past and present, and the volunteers who make Cooperative Extension a success. “Cooperative Extension individuals are very giving, very caring, very compassionate people who really care about communities and the people in them,” she said. “It is our pleasure as directors to work with this group of people who give so much of themselves to the community and to celebrate this centennial event with you. I just thank you for our past, I thank you for our present and I am very excited about our future and the next 100 years and what we’re going to do.” The event concluded with the unveiling of a Cooperative Extension Centennial flavored ice cream from the University’s UDairy Creamery as part of a flavor contest. The winning flavor, Centennial Cherry Chunk, was submitted by Joyce Witte, who was presented with a gift certificate for coming up with the winning flavor. 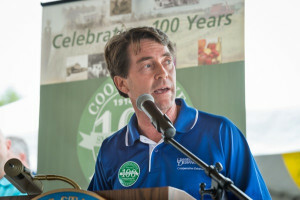 Rodgers joked that Witte can now “eat as much Centennial ice cream as you like.” For more information about the Cooperative Extension Centennial, visit the website. Article by Adam Thomas Photos by Evan Krape This article can also be viewed on UDaily.